The Rydges hotel is directly across from Sydney’s international terminal. While a nice hotel it is often expensive. Fortunately I was able to snag a deal and booked it primarily to plane watch before my flight to Cairns. Cairns was the original destination of this trip (although it suffered through a number of changes as well) and the original western route was to fly American’s 787-9 from LAX to SYD arriving on this very date. So there I am in seat 2A of that American 787. How often can you get 2 A380s and 2 747s in the same photo? Soon it was off to the terminal. Only I was at the international terminal and was departing from the domestic terminal. 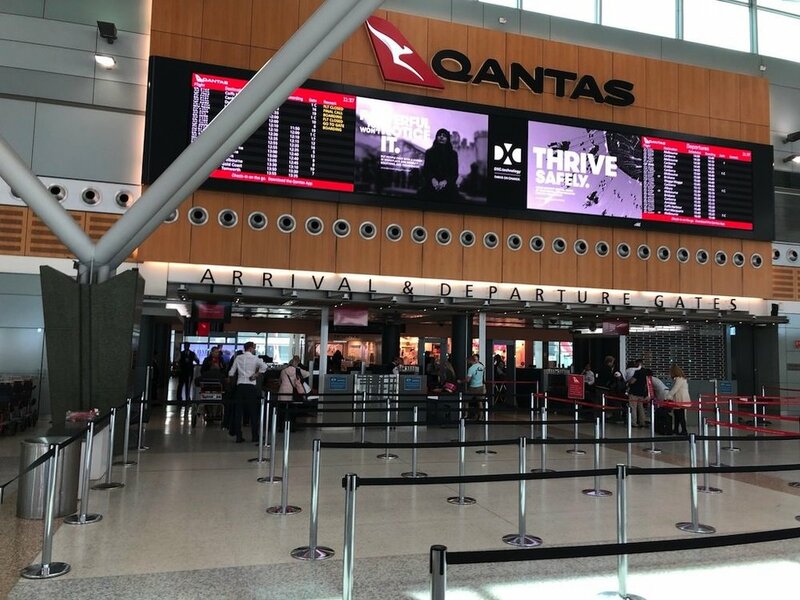 Qantas has a transfer gate where I could check-in in the International terminal and take a bus across the airfield to the Domestic terminal on the other side. That trip allowed for this photo, once I cropped out the heads of other bus patrons. 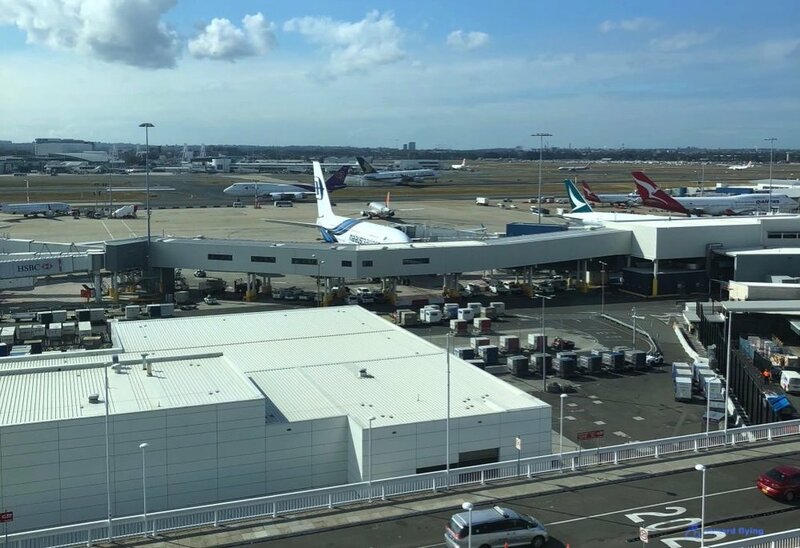 We’ll be seeing you soon VA.
After taking a peak inside the QF business class lounge which I reviewed last year I ventured over to a Priority Pass restaurant. Their kitchen was closed at 11AM, no chef, go figure. So I passed some time then headed to the gate. Boarding was on time and soon enough we were on our way. It’s a short flight up to Cairns, a little under 3 hours. And a nice day for flying. Qantas has a nice domestic business class seat. The cabin has 12 seats, 3 rows of 2x2. Strangely they block rows 1 and 2 from pre-assignment. So it was 3A for me. A better view. Notice the non partition between cabins. It’s the new thing I guess. A good reason to bring your own entertainment. The 737-8 monitors are circa 1990 on the Airbus A320. Pretty much all I can show you about the seat are these manual buttons to control the seat. This aircraft did not have any power at the seat. The good news is on this QF flight the FA, Thomas if I remember correctly, served me lunch whereas last time they missed me. Fish and chips, kind of, with mashy peas or something to that effect. But the fun was in the little box. 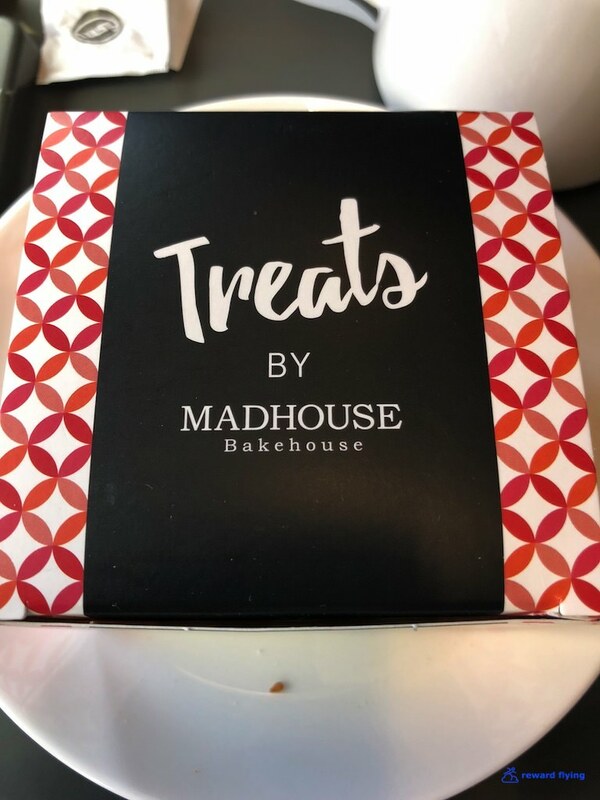 All I can say is if you run across a Madhouse Bakehouse, go inside. While dreaming about Madhouse Bakehouse we started our descent. I was on the wrong side of the plane for the best photos. This was a typical, acceptable domestic business class flight. No need for a rating. But if you insist I gave it a 5, which is average in my book. This flight was part of the Qatar ticket so I didn’t pay for this sector. 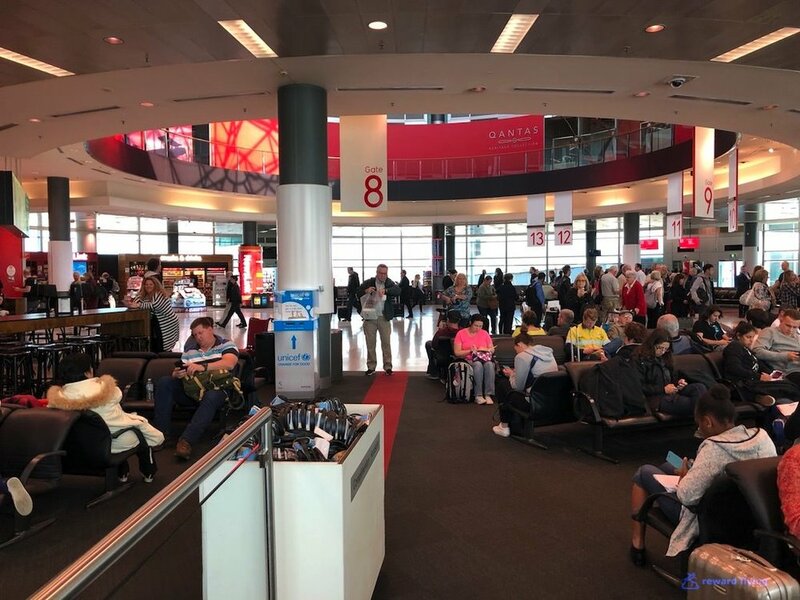 However you can frequently find availability on domestic Qantas flights and pay for them via American Airlines points, British Airways Avios and Alaska points. Cathay Pacific’s Asia Miles should offer them as well. The winner for this flight is British Airways at 15,000 points, which is an awesome deal. In fact right now BA is offering a 40% transfer bonus, that means this flight would only be 11,000 points!